Definitely positioned to compete with the Fitbit Aria Wi-Fi connected bathroom scale, Withings announced the U.S. launch of the WS-30 Bluetooth-connected wireless scale earlier this week. Similar to the Aria, the Withings WS-30 will automatically detect the person that’s standing on the scale based on previous weigh-ins. Basically, an entire family (up to eight people) can use the scale and they won’t have to select their name in the user interface. When a person steps onto the scale, the digital readout will quickly tell the person their weight in addition to tracking their body mass index (BMI). Different from the Aria, the WS-30 doesn’t offer the user an estimation of their body fat percentage. When setting up the WS-30 for the first time, the scale can connect over Bluetooth to an iPod, iPad or iPhone. The Apple device will automatically share the home’s Wi-Fi network configuration, ideally so the user doesn’t have to hunt down the wireless password. 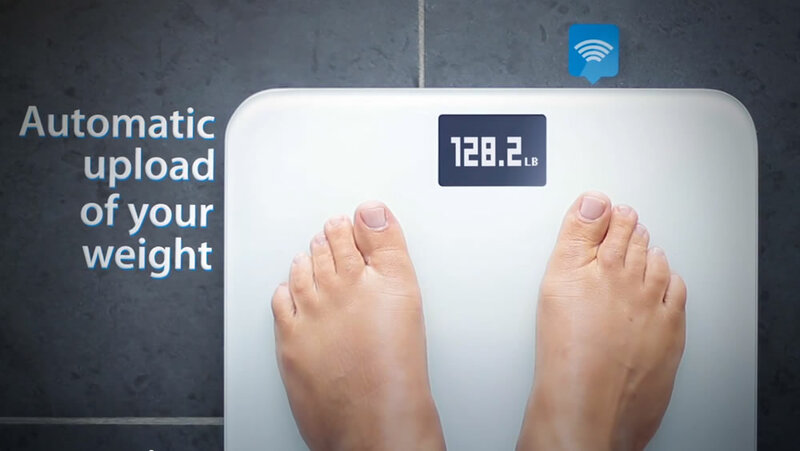 As long as the Withings scale is within range of the Wi-Fi router, it will automatically upload a user’s weight and BMI to a personal user profile. Using the Withings Health Companion mobile application for both Android smartphones and the iPhone, the user will be able to view a personal weight chart and track progress over time. 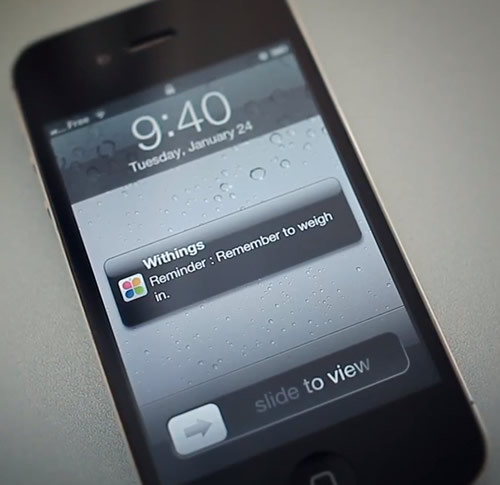 Within the application, the user can set a weight loss goal as well. 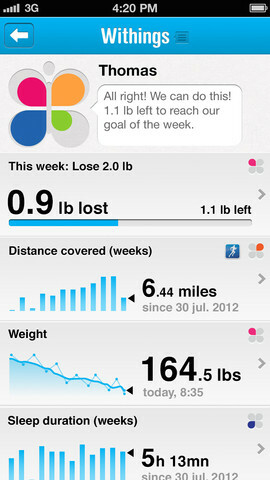 In addition, the mobile application can provide notifications on a regular basis as a reminder to step up on the scale. The development team at Withings has also designed the application to be compatible with other fitness applications. For instance, users can track Runkeeper’s exercise data, LoseIt! caloric intake data or Zeo’s sleep efficiency data within the Withings application. If a user wants to monitor their blood pressure, data from the Withings blood pressure monitor can also be fed into the application. According to the company, there are over sixty compatible applications that can feed fitness and health data into the main Withings application. All weight information can also be viewed on Withings site through a personal login. By default, the weight data that’s transmitted from the scale is kept completely confidential. However, Withings encourages users to share the data with family or friends in order to provide extra motivation to hit weight loss goals. Similar to the previous Withings scale, the WS-30 includes an option to share weight information on Facebook and Twitter. This feature can be setup for automatic publication each time a user weighs themselves or once a week. Users can also share weight information on those social networks manually through the user interface. Similar to the design of the Fitbit Aria, the slick glass top of the WS-30 can be easily cleaned with a damp cloth periodically. However, the device isn’t waterproof and hopping on the scale after taking a shower isn’t recommended The Withings scale runs on four AAA batteries, comes with a one-year warranty and is only available in white. Identical to the Fitbit Aria in price, the Withings WS-30 bathroom scale is priced at approximately $130.